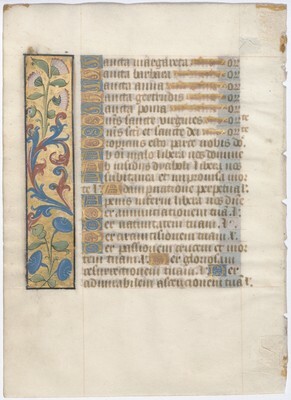 The leaf is from a Book of Hours dismembered by Otto F. Ege for inclusion in specimen sets of medieval manuscript leaves he compiled in the 1940s under the title "Fifty Original Leaves from Medieval Manuscripts". It is listed as no. 48 of the fifty exemplars. Contents: Litany of saints - the end of the list of male saints followed by the names of female saints and orisions. Five saints invoked in the Litany are traditionally linked to the Diocese of Châlons-sur-Marne (since 1998 Châlons-en-Champagne), namely, Saints Alpin, Germain, Memmius, Elaphe and Poma. St Memmius is venerated as the first bishop of Châlons. Local legend maintains that Châlons was evangelised by Memmius, assisted by his sister Poma, in the first century. The association to Châlons is further supported by the invocations to two other early bishops: St Alpin who served as bishop of Châlons for 47 years (433-480) and founded the Abbey of St Memmius in the diocese, and St Elaphe who was bishop in 579. Decoration: 39 1-line initials in gold on alternating blue and pink grounds and well modelled "bois écotés" branch-like line fillers in gold. Marginal side panel in gold with flora, consisting of acanthus tendrils in blue, white or red in the centre and a carefully detailed flower painted above and below.